Thank you for choosing RadDataFilter! Building complex filter expressions in a breeze with Telerik DataFilter. 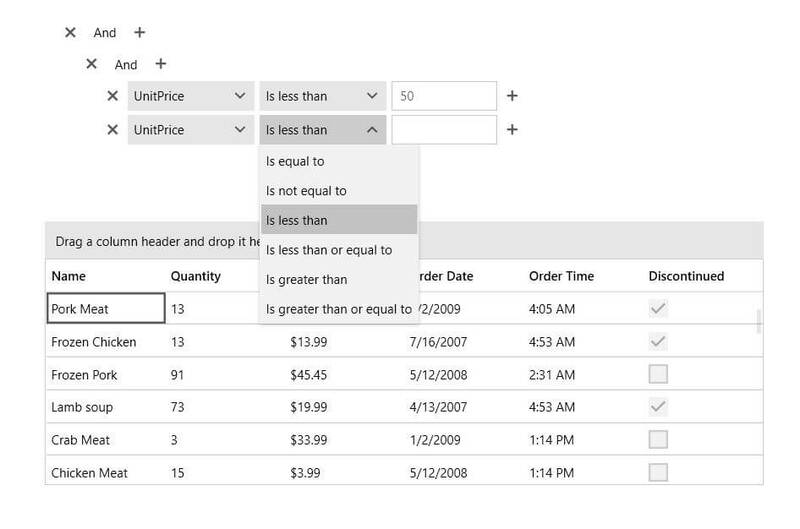 The control allows specifying expressions based on the data and collection type of the source fields. The intuitive UI of the control is designed to facilitate the end-user while empowering the developer to create related expressions with a few clicks. Visual Expression Building - with the extremely intuitive UI, RadDataFilter is very user-friendly. Select your filter options with a simple point-and-click. The control allows specifying expressions based on the data and collection type of the source. You can build complex expressions on multiple fields with And/Or operators and myriad of filter functions. Seamless Integration - RadDataFilter can communicate with any kind of collections (even a plain IEnumerable). The control can then be bound to any ItemsControls (GridView, TreeListView, ComboBox, TreeView etc.) to the filtered endpoint called FilteredSource. This allows extreme flexibility and loose coupling.